Our pebble mesh tile line harmonizes gracefully with a multiplicity of other design elements: natural to techno-modern indoor or outdoors. The collections work well for floors, walls, ceilings, fireplaces, walkways, borders and decorative accents. As natural material, pebble tiles yield to water, and any place water flows, including: bathrooms, showers, spas, kitchens, gardens, pools, waterfalls and fountains. Distinctive in color and species, pebble tile is a natural product, where no two pieces are exactly alike. Veins, lines of separation and occasional flaws are inherent to the nature of pebble tile and are considered to be desirable in the product. All natural stone will vary in size, shape and color. 10 square feet, 10 pieces per case. Case weight is 37 lb. Buy online Solistone River Rock Turquoise 12 in. x 12 in. 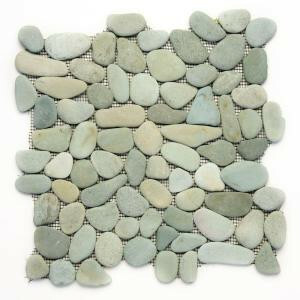 x 12.7 mm Natural Stone Pebble Mosaic Floor and Wall Tile (10 sq. ft. / case) 6006, leave review and share Your friends.